If a company could own Christmas and Halloween, Disney would be the one that would want to have it. The 20th Anniversary brought a renewed focus on the two end of year seasons and the St. David’s and Patrick’s day celebrations, the magic of the 20th Anniversary increased for guests during these special times of year. 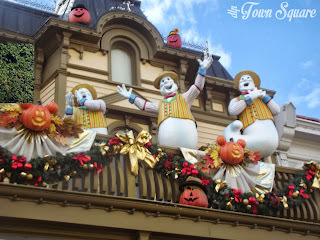 As guests walked onto Main Street USA during October 2012, they will have noticed that ghosts have invaded the street, not scary ghosts but friendly ghosts. Main Street USA had become a turn of the century ghost town, gone was the ‘in your face’ orange, in came a more classic Halloween for all the family. Our friendly ghosts had tried their hand at being a band, guides, being a mechanic and even baseball. Witches had invaded lamp posts and turned them green. Life on Main Street carried on as normal, with the slight addition of cackled laughter every so often. 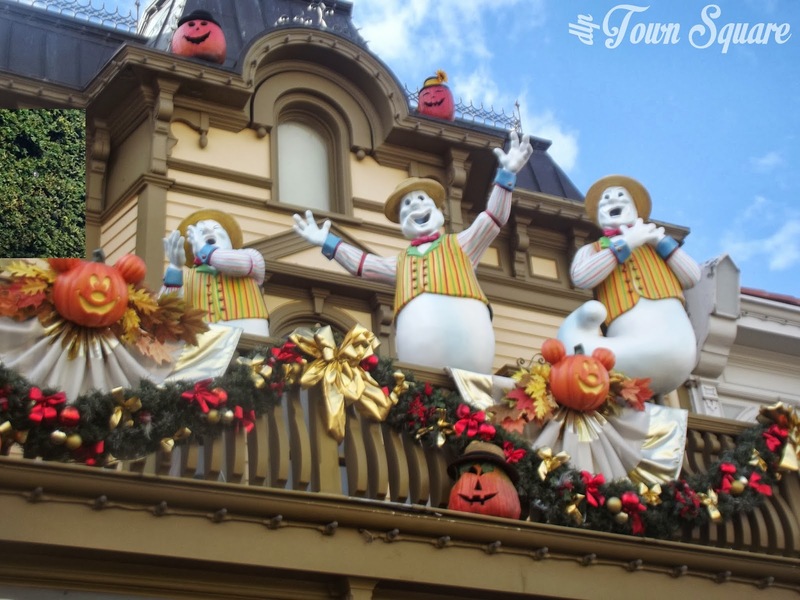 Main Street Station’s 20th banner was joined by silhouettes of Disney characters in their best Halloween outfits going trick or treating. Central Plaza saw our Disney pals appear in giant Pumpkin form. Frontierland wasn’t missed out either! The former ‘Halloweenland’ concept was scrapped for 2011, but the pumpkin men had still invaded the Lucky Nugget and the Fort. The restaurant offered a special meal featuring a specially designed burger and a ghostly cupcake for desert. Entertainment wise, Mickey’s Trick or Treat returned, as did the Villains and Jack Skellington. The Walt Disney Studios saw no new decorations, but had host two nights of horror in their ‘Terrorific Night’ joined by Disneyland Park’s yearly tradition ‘Halloween Soirée’. 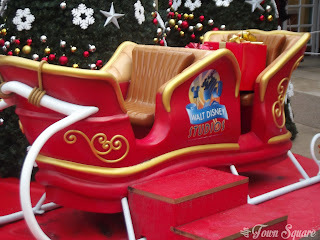 Disneyland Paris continues to build on last years successful decorations this year by modifying a few features, as well as the exciting addition of a Halloween Cavalcade. characters all wrapped up warm in the best Christmas clothing. The floats are fantastic, and the music is delightful and warm. Disney’s 20th Anniversary Enchanted Christmas had the bases built for future years growth and filled Disneyland Paris fans with promise for what the season could be in just a few years. This year Christmas grows even further with a new Dreams! 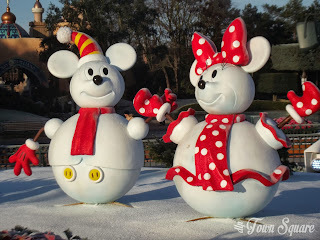 show and new floats in the Christmas Cavalcade featuring our new Frozen friends! Whilst the 20th Anniversary and these improvements may have been just a happy coincidence, there is little doubt that the future of special seasonal celebrations in Disneyland Paris are going from strength to strength and that last year was just the start of a beautiful future. Some may complain that features have been removed, but those being added last year and this year more than make up for that. We cannot wait to see what the future holds. 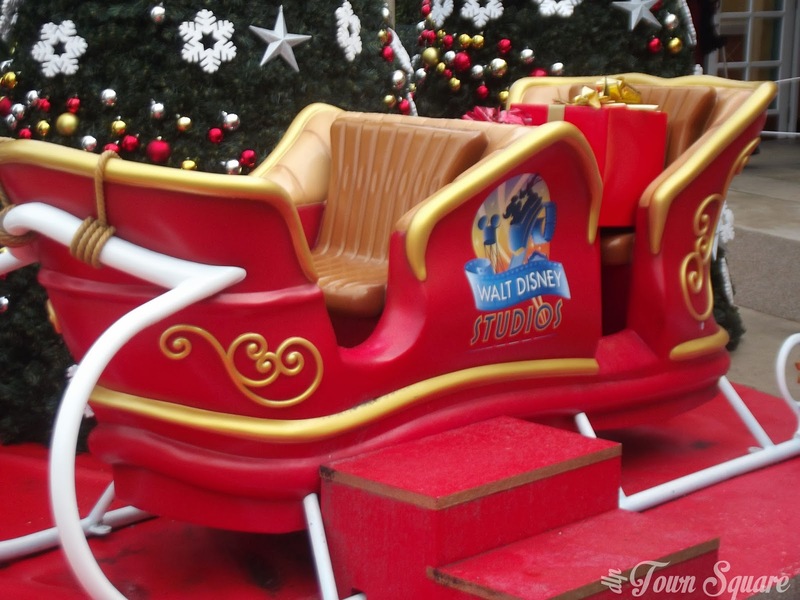 PreviousPrevious post:20th Highlights: Disney Magic on Parade!NextNext post:What’s New, What’s Next Day 1 Recap: Refurbs, Refurbs and more Refurbs!